In the last months of the project, LCEC continued to promote awareness raising activities related to MED-DESIRE, in order to reach a wider range of audience and maximize the benefits of the project. As such, LCEC collaborated with the leading Lebanese radio station “RadioOne” for a one-whole-month awareness program through the social networking site “Instagram”. LCEC prepared a set of multiple-choice questions about renewable energy and energy efficiency and each day one question was posted on the RadioOne Instagram @Radioone.fm. The campaign was held from 17 August to 17 September 2015 where 2 daily random participants with the correct answers won the MED-DESIRE solar lanterns and solar lamps in addition to the MED-DESIRE awareness raising brochures and bags. As a total, 48 everlights and 24 solar lanterns were given out to the winners. 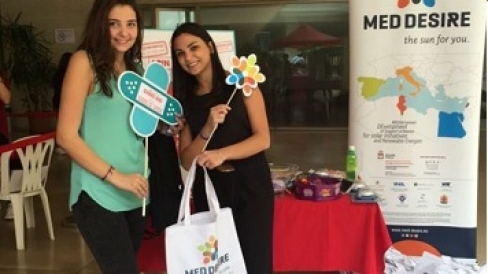 In order to integrate the objectives of MED-DESIRE with other common causes, LCEC collaborated with Donner Sang Compter that organized several blood drives in several universities. The first event was on November 4, 2015 from 9:00 am to 3:00 pm at the University of Saint Joseph (USJ) whereas the second one was at the Notre-Dame University (NDU) on November 28 from 9:00am to 3:00 pm. Donner Sang Compter (DSC) is a non-governmental organization that works for a humanitarian cause. They provide blood to patients in need through a centralized database of potential blood donors and by regularly organizing blood drive campaigns to collect blood units and to raise awareness about the importance of voluntary blood donations. By participating to these blood drive, LCEC achieved to link environmental and energy issues with this humanitarian cause. The events included several games and activities to which the blood donors participated in order to win solar lanterns. The importance of this event is to educate people about just as donating blood, could save someone’s life, being energy efficient and taking conservatory approaches in our daily life could enhance the environmental conditions of the country and contribute to saving the planet.